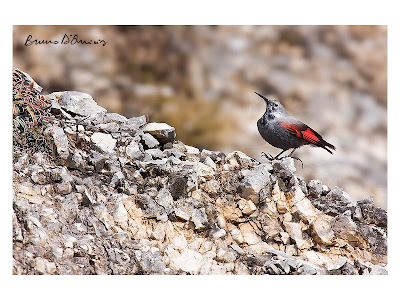 Just this morning I had my first photographic opportunity with a true myth of the mountains, here in Abruzzo as elsewhere in Europe, the wallcreeper. I ran after this acrobatic and restless flyer for half hour. Up and down on a very steep slope, partially covered by snow and ice, holding the breath to not shake the handheld camera, I obtained a couple of nice images of this rare and elusive creature - a little milestone in my commitment to document the wildlife of the Apennines! Then, suddenly as it had appeared, the bird flew away, straight into the blue mountain sky. My images from Morocco are featured in a 12 pages article in the German magazine Naturfoto. My family has a small house near Penne in the Gran Sasso national park. I am a zoology student, an avid naturalist and conservationist and have always longed to see a wallcreeper. Can you advise the most reliable places in the Abruzzo region?